Bring a fruity touch to your winter greys with Paloma, our delicious raspberry-toned nail polish. As part of the PURE color range, it boasts a plant-based formula made from natural-origin raw materials and is vegan-friendly and cruelty-free. 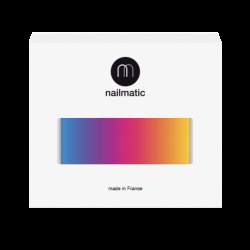 PURE color is a range of cleaner, greener, 10-free nail polishes. Result! What does that mean? Our PURE color range is made from plant-sourced natural ingredients, including renewable raw materials such as manioc and cotton. As a result, these polishes contain plant-derived solvents rather than those made from petrochemicals. The first rule of manicure club is: start with clean hands! Wash off all creams, dust and fibres before you get down to business to ensure a smooth surface and a long-lasting finish. 1/ Did you think we wouldn’t notice if you skipped base coat? Not likely! This step is key for protecting the nail and for ensuring your color lasts longer. 2/ Apply one coat of Paloma. Thanks to our specially-designed brush, application is as easy as 1,2,3: one stroke down the centre, one on either side and Bob’s your uncle! 3/ For added coverage, apply a second coat of color. 4/ Color without top coat? No thank you! Add a slick to increase shine and hold. This polish brings a dose of color to lighter skin tones, especially when contrasted with jeans and a t-shirt or a minimal grey look. Broken nail? File them all down to the same length – it’ll look much neater!